We have the pleasure of working with various people across a range of areas, from small organic growers, to brewers and bakers. We’re really excited about the work we do together and want to share their stories. We hope you find them as interesting as we do. The Sustainable Food Story is a roving supperclub that travels around the UK connecting citizens to the origins of our food through interactive dinners. Founded by Global Generation’s Skip Garden eco-chef Sadhbh Moore and Future Farm Lab’s Abi Aspen Glencross, an ex-lab meat scientist turned farmer and botanical explorer, the ladies gather a team of scientists, chefs, activists, story tellers and farmers to create delicious experiences, all who believe that we can go so much further than farm-to-fork. They group grow their own produce and create close relationships with other producers; utilise surplus and under-utilised goods; forage in our edible world; and demystify and discuss food and farming issues through stories. We had the pleasure of meeting Abi after she spent some time at Blue Hill at Stone Barns in New York (state not city, because where would you fit a farm in New York!?) where Adam Kaye mentioned us and suggested that upon her return to the UK, she organise a visit to Duchess Farms. The rest as they say, is history. Check out their website for upcoming events. Friends of the Earth International is an international network of environmental organisations in 74 countries. We have joined up with them recently in their work to protect bees who are a vital cog in the planet’s eco-system. As a rapeseed grower we have committed to not using harmful pesticides. They have a wonderful website dedicated to this which you can browse through the link below. Rapeseed Oil Benefits is an independent not-for-profit website launched by AHDB (Agriculture and Horticulture Development Board) to improve awareness of the benefits of rapeseed oil as part of a healthy balanced diet and to inspire you to use this cooking oil. You'll find everything you need to know including nutritional info and delicious recipe ideas. For more information, have a look at their great site complete with recipes, videos and more. There’s a man in Hackney who forages for wild food and supplies it to businesses – and he goes by the name John the Poacher. John became fascinated by the wild as a child and most of his skills are self-taught. “My grandfather and father were fishermen,” he explained. “Through that I used to fish with a group of kids. An Irish guy taught me how to snare a rabbit and then I started picking books up and went around finding interesting things that nobody else could source. “People ask me for stuff and if I don’t know what it is I’ll go and research it and find it. “The rarest things I’ve found? The sharon fruit is up there. I also saw an orange tree recently, and found kiwi fruit. They are the most exciting things, I think." 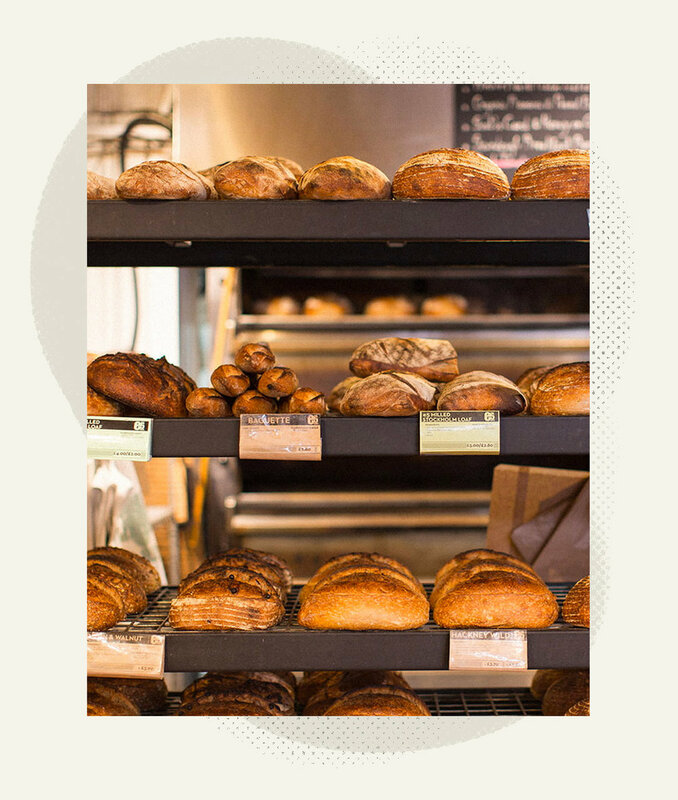 The E5 Bakehouse is an East London artisan bakery and coffee shop who are passionate about sourdough and the lost traditions of their baking ancestors. Using organic, locally-sourced ingredients, they serve delicious, daily-baked breads, fresh lunches, homemade cakes and coffee. On top of this, their wonderful head bakers also share their knowledge and expertise in a weekly bread course. We're currently growing a heritage wheat crop exclusively for E5 and can't wait to taste some of their delicious bread made with it come late summer/early autumn. To find our more about E5, go check out their website. OrganicLea is a community food project based in the Lea Valley in north-east London. They produce and distribute food and plants locally, and inspire and support others to do the same. With a workers’ cooperative at their core, they bring people together to take action towards a more just and sustainable society. At the farm we have ploughed and cultivated a small area for OrganicLea to start planting in the Spring and can't wait to see what delicious produce they grow! To volunteer or to find out more, visit their page.